For your privacy with confidential or sensitive information, NANOBLIND privacy filter shields or blacks out your screen from shoulder surfers, visual hackers, wandering eyes and prying eyes beside you. It maintains touch screen functions. It is removable and reusable without residue and bubbles. NANOBLIND privacy film transmits necessary light only while shielding unnecessary lights such as diffused light, reflective light, and back-light. Nobody can see the contents when viewed from both left and right sides at 30 or higher degree angle while you get to see the crystal clear contents on the screen. It is a damage proof film that is protected from external shock or impact due to multiple layers of UV 3H hard coating. It has anti-contamination and anti-glare functions. It is a 4 way NANOBLIND privacy filter for Apple iPad 2. Nobody can see the contents when viewed from both portrait and landscape orientation at 30 or higher degree viewing angle while you see crystal clear images on the screen. 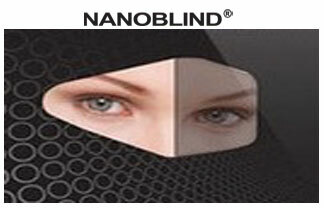 It is a 4 way NANOBLIND privacy filter for Apple iPad 3. Nobody can see the contents when viewed from both portrait and landscape orientation at 30 or higher degree viewing angle while you see crystal clear images on the screen.